Most would look at the Mercedes-Benz G-Class and see a vehicle built for extremes — and they would be absolutely correct. But engineers in Affalterbach looked at the G-Class and said, "Let's make it more extreme." Thus the Mercedes-AMG G 63 was born. And now, they´ve taken that machine to its furthest extreme yet, with a 2019 model that preserves the icon's classic design while making it capable of extraordinary feats. Total command to every adventure. The handcrafted AMG 4.0L V8 biturbo engine generates 577 hp and 627 lb-ft of torque. It sprints from 0-100 in just 4.4 seconds. And its two twin scroll turbochargers guarantee a whip-fast response. That power and agility are further enhanced by a 9-speed transmission that uses model-specific software to achieve remarkably fast shift times. 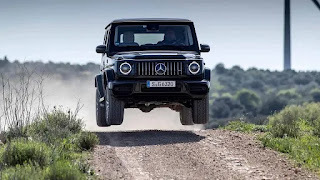 In a further departure from the previous model, the AMG Performance 4MATIC all-wheel drive now features a 40 to 60 percent front/rear torque distribution, giving the G 63 maximum traction during acceleration. When it´s time to leave the well-traveled road — or any road at all, for that matter — the G 63 is in its element. In addition to five AMG DYNAMIC SELECT on-road programs, there are three off-road modes — "Sand," "Trail" and "Rock" — that guarantee the best performance whatever environment you´re in. The bodyshell has been constructed with a new material mix of steel and aluminum to preserve a lighter weight while delivering improved strength and durability. Outside, the G 63 remains one of the most iconic designs on any road. Inside, it departs from tradition, with a completely redesigned dashboard featuring analogue tubes, dial instruments and a Widescreen Cockpit. It´s also larger and more spacious in every dimension, bringing total command to every adventure. The new 2019 Mercedes-AMG G63 is a real beast. It’s capable of reaching 62 miles per hour (100 kilometers per hour) from a standstill in just four seconds (although Mercedes says it’s 4.5 seconds), yet it’s one of the best off-roaders on the market today. The “reinvented icon” as the German automaker calls its boxy SUV is now ready to hit the U.S. showrooms and it has been announced its starting price will be $147,500 without the $991 destination and delivery fee. To put that into perspective, the most powerful G is just $2,050 cheaper than the Mercedes-AMG S63, which starts at $149,550. The two share a handcrafted AMG 4.0-liter V8 twin-turbo engine that’s good for 577 horsepower (430 kilowatts) and 627 pound-feet (850 Newton-meters) of torque in the G63. Of course, $147,500 will buy you a G63 with pretty much all tech features Mercedes could offer you today. These include a nine-speed automatic gearbox, Ride Control sports suspension, performance exhaust with adjustable flap system, and a 12.3-inch central display for the infotainment system. In addition, the AMG Dynamic Select system offers five drive modes and three extra off-road modes – Sand, Rock, and Trail.